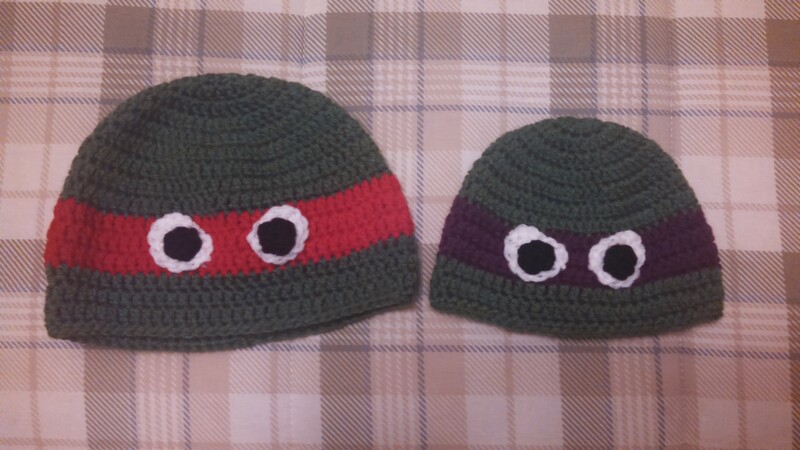 These two hats were fun to make. 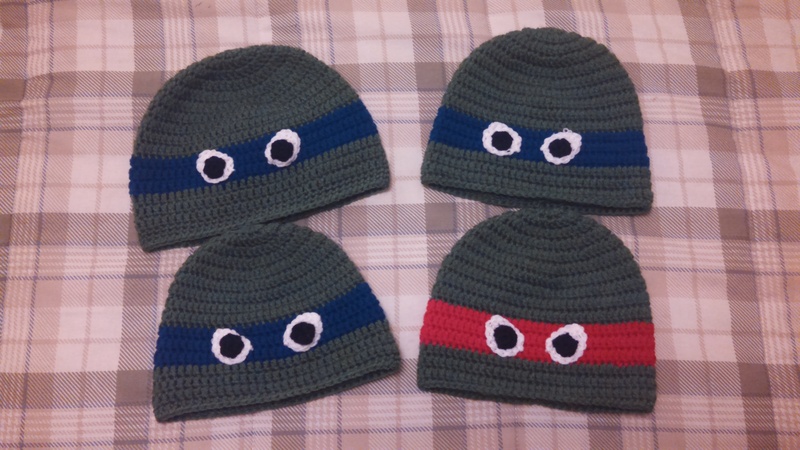 They were a special request for a little guy battling cancer, and I was glad to make them! 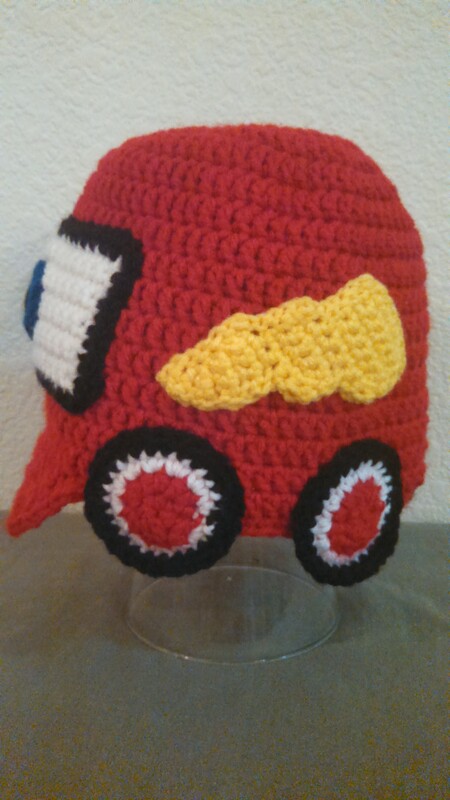 The first hat, I made to look like Lightning McQueen. Ka-chow! I really love how it turned out. The second was navy with white and red bands. Round 16: DC in each around, join, and finish off. Weave in ends. Count 21 from seam. SC in front loop of next 22 st.
Ch 1, turn. SC in 22 st.
Ch 1, turn, SC in 22 st. 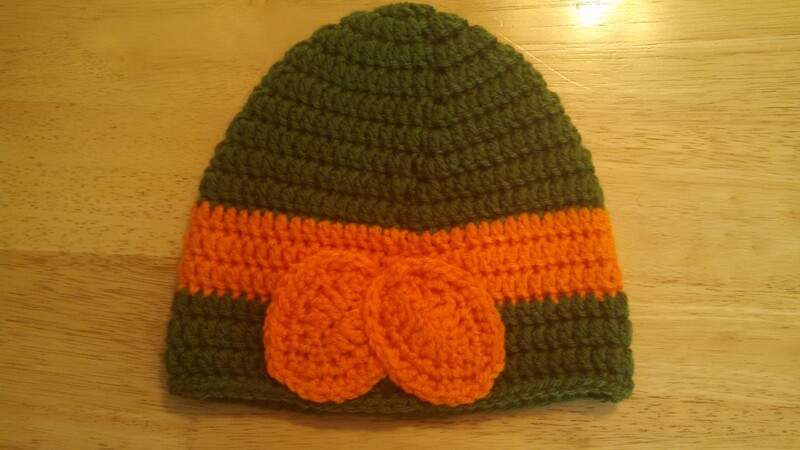 Finally, I did a SC along the entire beanie and brim. Round 1: Ch 2. 6 HDC in first ch. Join. Ch 1. Round 2: 2 HDC in each st around. Join. Ch 1. Round 3: 2 SC in each st around. Join. Ch 1. Round 4: HDC in each st around. Join. Finish off. 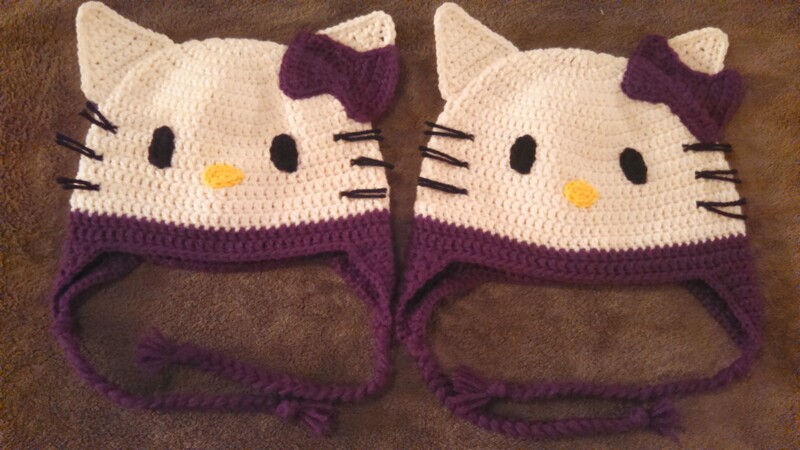 Now that I made 2 more Kitty hats, I remember now how I did the bow! So, I wanted to share the pattern. 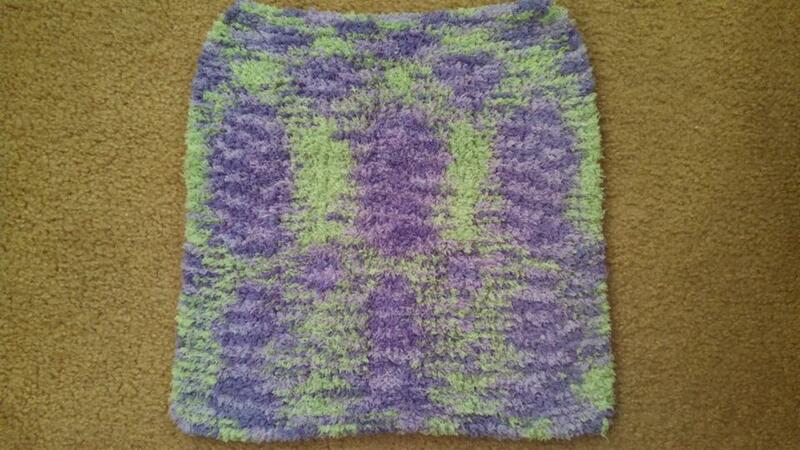 This was done with worsted weight yarn, in this case Red Heart Super Saver in Dark Orchid, and a size H hook. Round 1: 8 sc in 2nd chain from hook. Sl st in 1st st. Ch 1. Round 2: 2 sc in each stitch. (16) Sl st in 1 st. Ch 1. Round 5: sc across (10). Tie off and weave in end. Edging: sc around entire bow to finish off. Tie off and leave a long enough strand to attach to project. 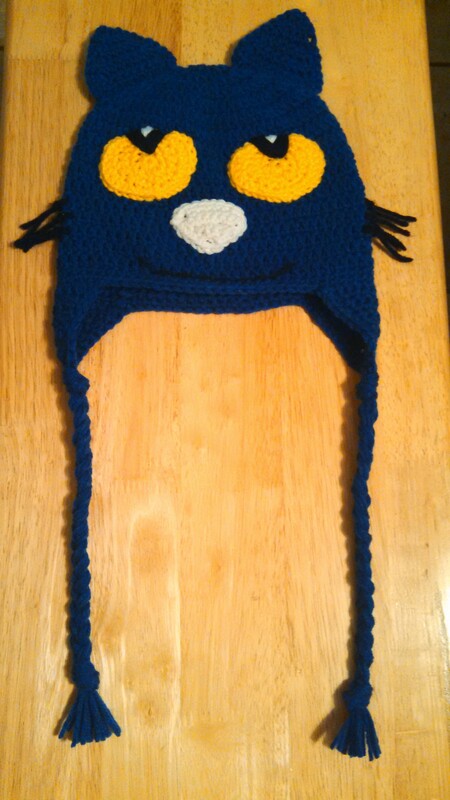 If you want to make the whole kitty hat, I have how I do a the main beanie in this post, along with links to the patterns for the ears, eyes, and nose. 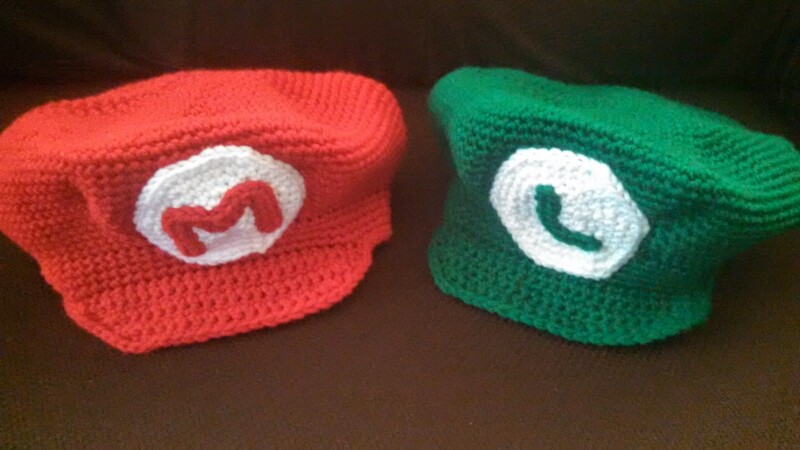 When I saw these hats, I knew exactly who I needed to make them for. He’s a tough little guy who was diagnosed with Type 1 diabetes, and he just had his 6th birthday. I found some play mustaches to order to go with these, and he grinned from ear to ear when he saw it all. I’m glad to put a smile on his face, although it’s not hard to because he’s such a happy, easy-going kid. 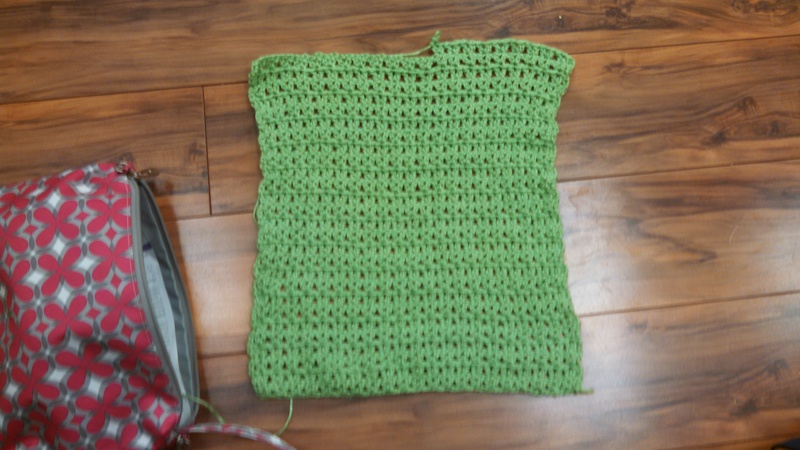 I used Red Heart Super Saver yarn in Cherry Red and Paddy Green, and used a size H hook. If you find it hard to follow, scroll down to the comments and someone wrote parts of it out to make it hard to follow. My only change was that I did one less decrease, so Row 31 was 1 sc in each sc to keep it 72 around instead of 66. They were a little big on him, but I wanted them to be bigger and not too small. 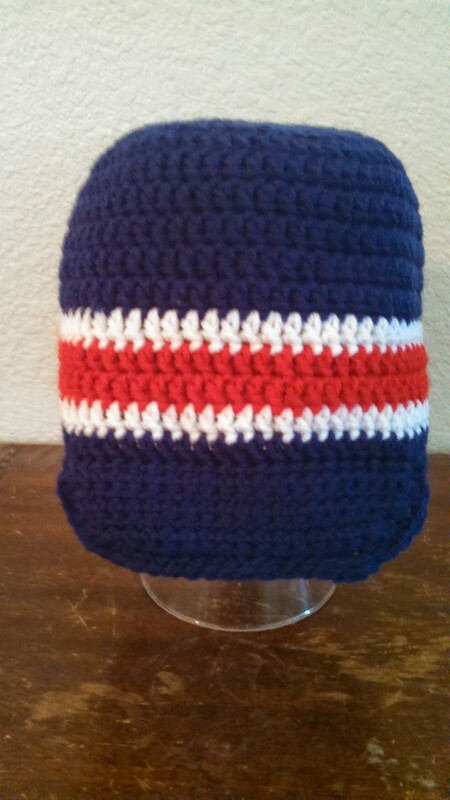 I have plans to make these hats in blue for a couple of members of my Kiwanis Club for convention. Instead of the “M”/”L”, they will attach the Kiwanis logo. I will share once I get the yarn and get them made! 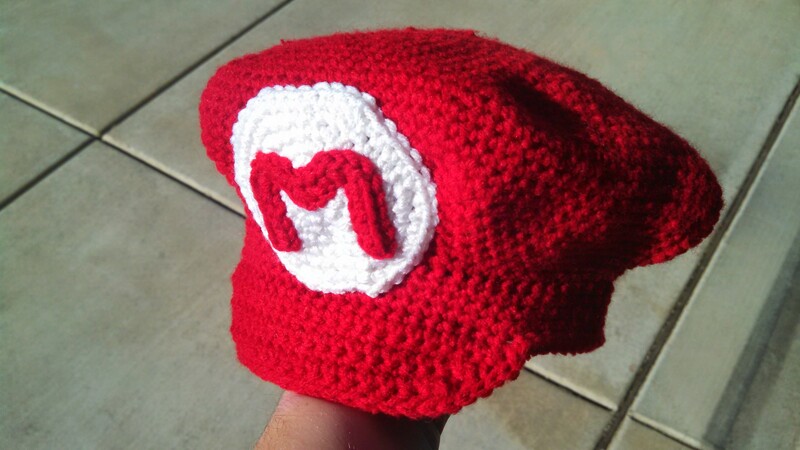 This hat was requested by a friend of mine. I honestly wasn’t sure if I could do it, but I was certainly up to the challenge. I have knit scarves and blankets, but not a hat. 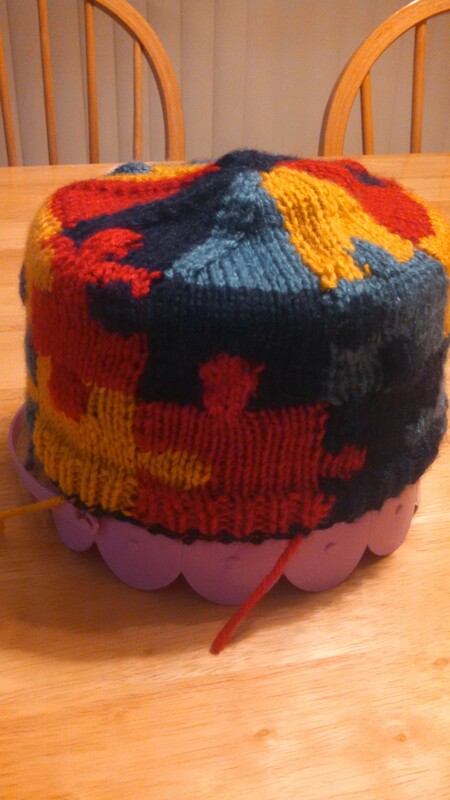 Plus, this hat pattern uses a technique I was not familiar with before, intarsia, where you use a separate bobbin of yarn for each color in a row. 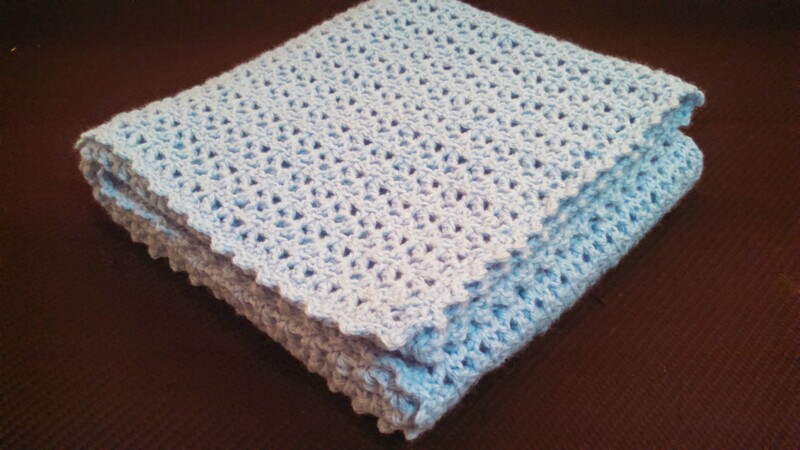 I watched a couple of videos on YouTube, practiced on some scrap yarn, and was ready to give it a go. Now, I did do a little crossing in mine, just because I was getting tangled up enough with all the bobbins of yarn already, but these pictures give you an idea of what that involves. At times, yarn was everywhere! It took me about a week to really sit down and get it done, and I am very pleased with how it came out. 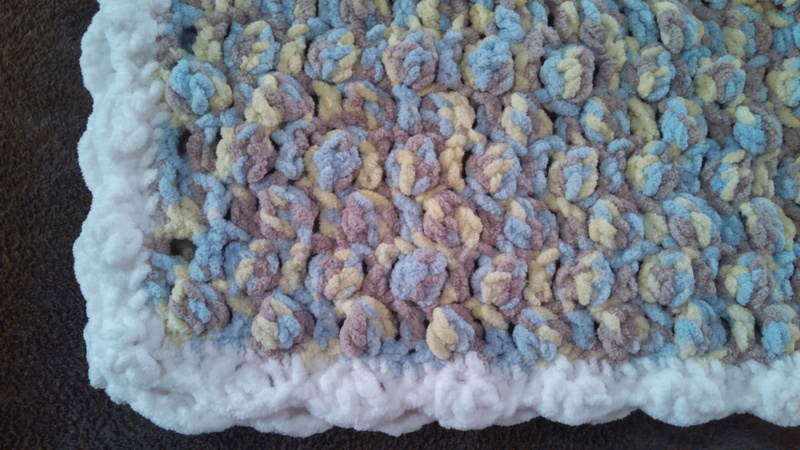 I love the colors, and I really like the Vanna’s Choice yarn. 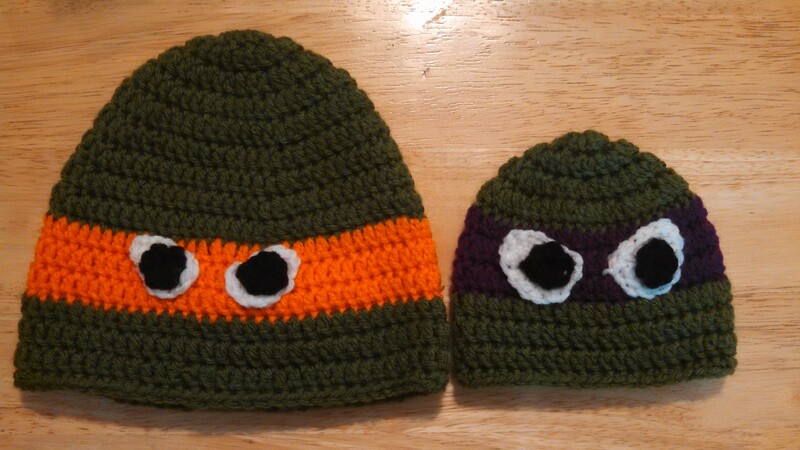 It’s the same yarn I used for the green in the Ninja Turtle crochet hats. 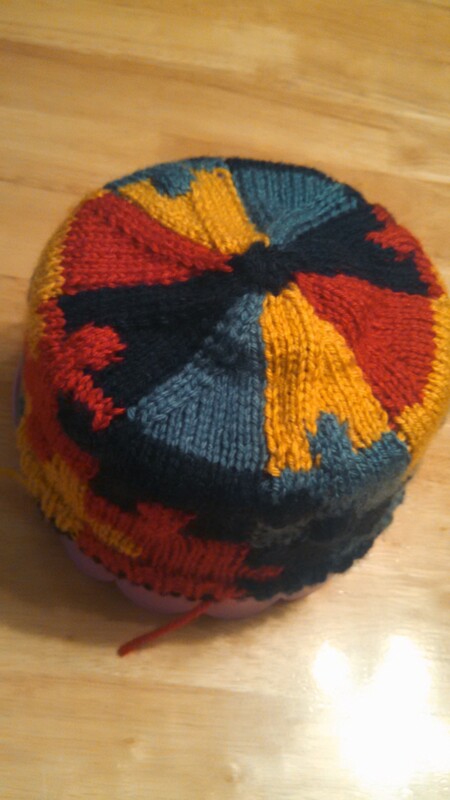 It was tricky to get the ribbing (K1, P1) and the color changes done at the start of the hat, but I made it work. 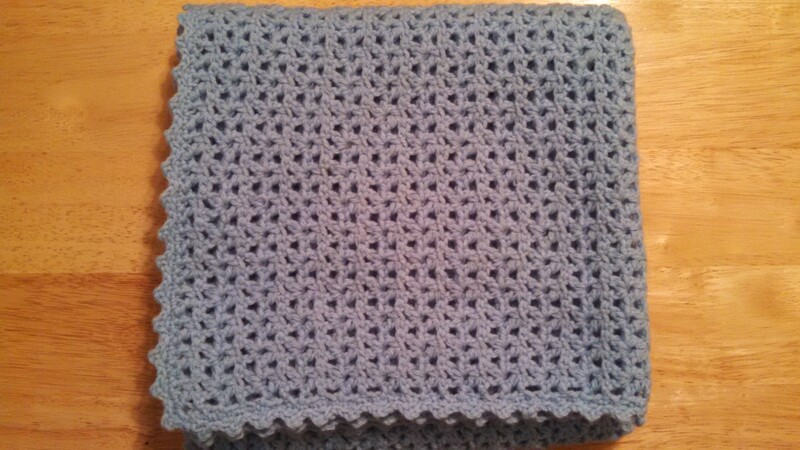 I have plans to make another one, and I may do the ribbed band at the bottom in the navy color, and then start the puzzle piece pattern. 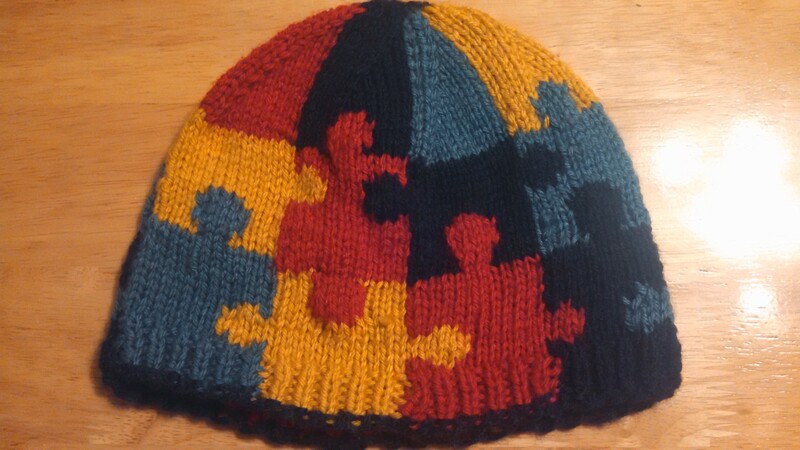 Here is a link to the pattern: Autism Awareness Puzzle Hat Knitting Pattern. It was easy to follow, and the charts for the puzzle pieces were amazing. 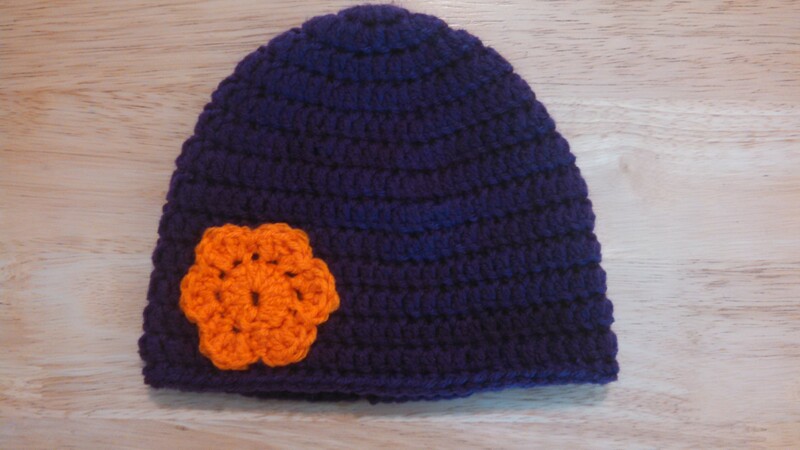 Lots and lots of Crochet Hats! 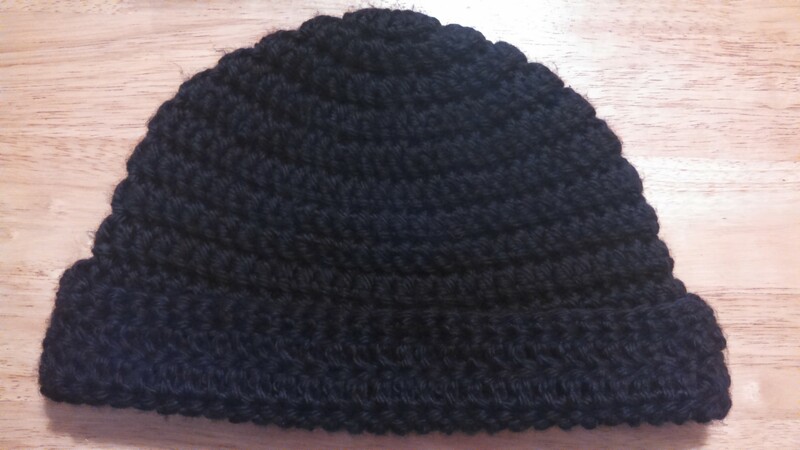 After making the black crochet hat for my husband, I followed up with a lot more crochet hats. Like 17 more over a month and a half time period. I had a few other projects mixed in there too, which I will talk more about soon. For younger children, I would only increase to 64, and end with 15 or 16 rounds. For toddlers, I would increase only to 60 with 12-14 rounds. Infants, either 48 or 56, with 10-12 rounds. All heads are different sizes, and when in doubt, I make it bigger. A bigger hat can still be worn while a hat too small cannot. If you need to make it bigger, I continue the increase pattern, 2 DC, DC in next 16 to get to 72, 2 dc, DC in next 17 to get to 76. 76 is the largest I have made, that fits a larger size adult head or a head with a lot of hair. 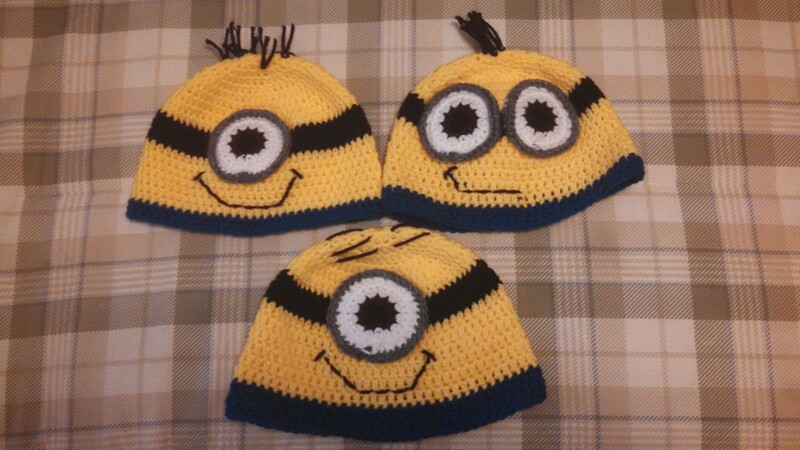 Link to pattern for Minion hats: http://www.repeatcrafterme.com/2014/01/crochet-minion-hat-pattern.html. I did the first as HDC in pattern, then switch to the DC pattern I posted above, doing the black as 2 rows DC. 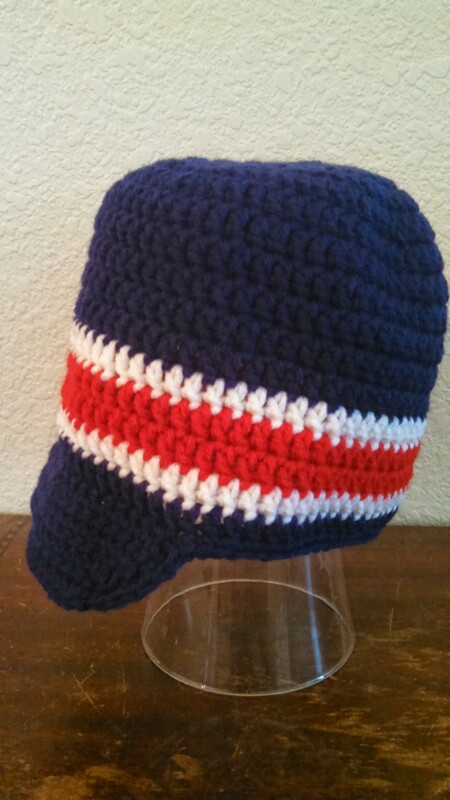 I didn’t do earflaps, and did the last 2 rounds of the hat in royal blue. Eyes Magic ring, chain 1 and SC 8, join, ch 1 (8 SC) Round 2: 2 SC in each stitch around, join, ch 1 (16 SC) Round 3: 2 SC in first two stitches, HDC in next, 2 DC, HDC, 4 SC, HDC in next, 2 DC, HDC, 2 SC. Round 4: 2 SC in first stitch, 2 SC in next, 2 HDC, 2 DC in next 2, 2 HDC, 2 SC in next 4, 2 HDC, 2 DC in next 2, 2 HDC, 2 SC in next 2. Fasten off leaving long tail to sew onto hat. 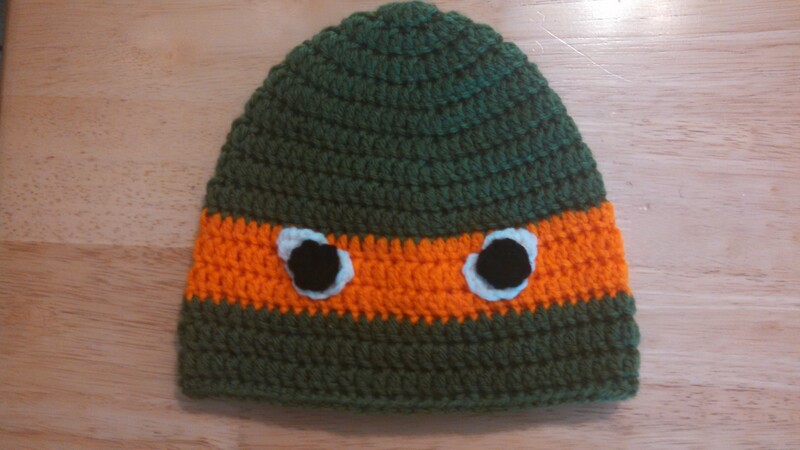 After attaching eyes to hat, make a triangle with black yarn stitches, then smaller triangle in white. Nose Ch 2. Row 1: SC in first chain. Ch 1 and turn. Row 2. 3 SC in stitch. Ch 1 and turn. Row 3: 2 SC in first stitch, SC in next, 2 SC in last stitch. Ch 1 and turn Row 4: SC across (5). Ch 1 and turn. Row 5: 2 SC in first stitch, SC in next 3, 2 SC in last stitch. Ch 1 and turn Row 6: SC across (7). Ch 1 and SC all around. Fasten and leave long tail to attach to hat. 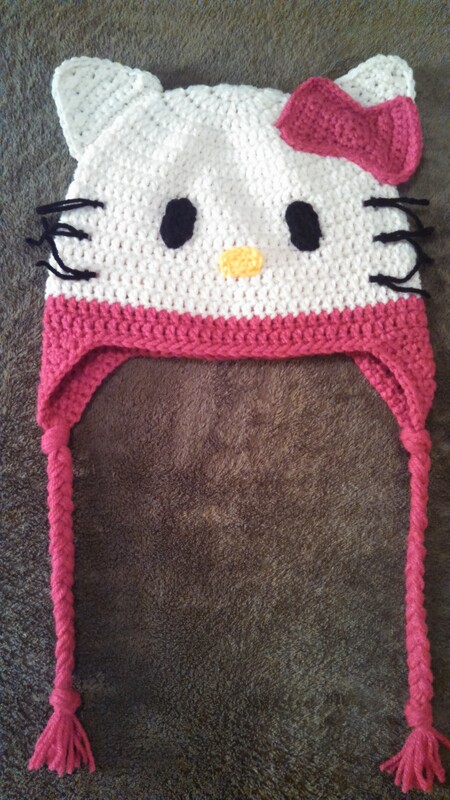 Link to pattern for the eyes and nose: http://crochetincolor.blogspot.com/2012/03/hello-kitty-hat-pattern.html. I made up my own pattern for the bow. 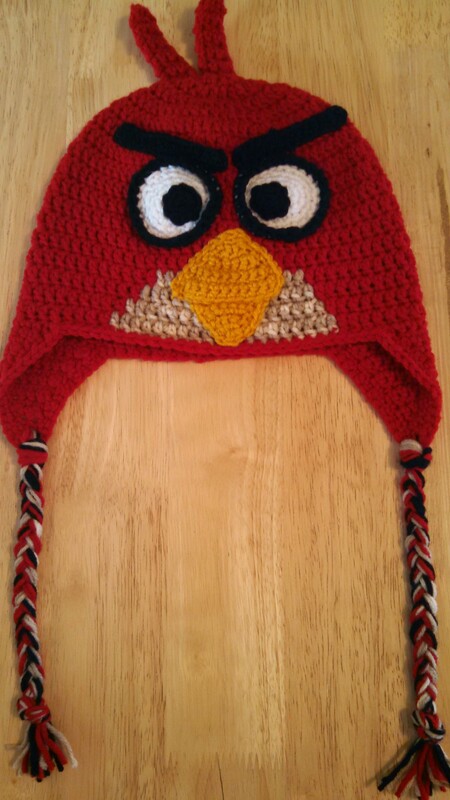 Link to pattern for Angry Birds: http://amray1976.blogspot.com/2011/12/crochet-angry-bird-child-hat.html. 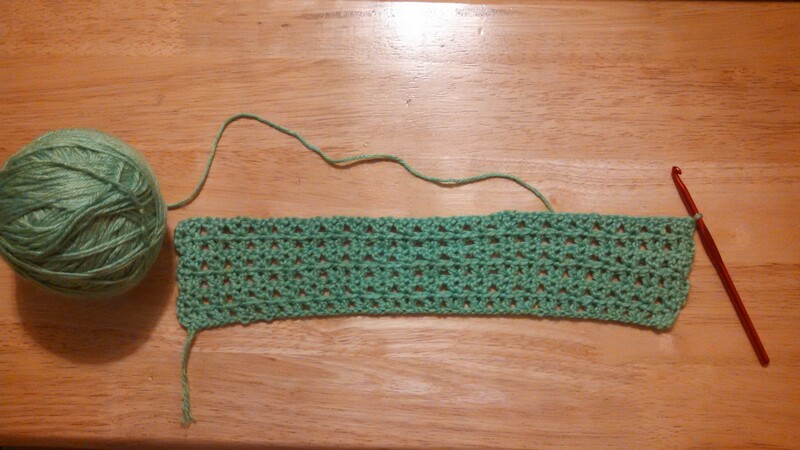 Instead of the tan bottom, I switched to tan yarn for part of the last few rounds to make more of a tan belly look. The beak I created my own pattern, making 2 triangles similar to the nose on the Pete the Cat hat. 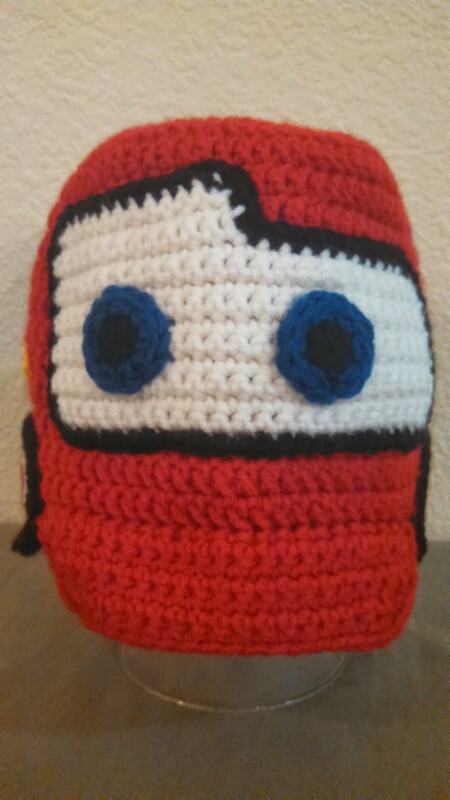 Because I used a thicker yarn than the pattern and he has a big head, I made a few changes. He also wanted a cuff on the hat to be able to roll up. Rnd 1, 2, 3, 4 same as pattern. 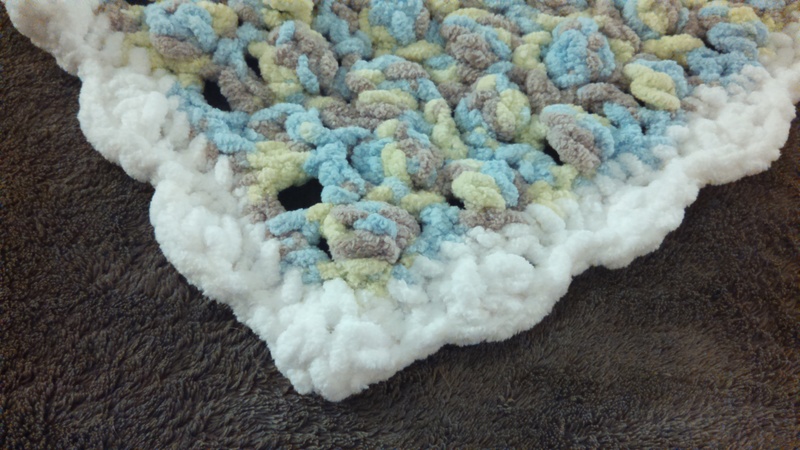 Rnd 16: sc in every stitch, slip stitch to first stitch, fasten off. Now that I have this down, I have some fun hats in the works. 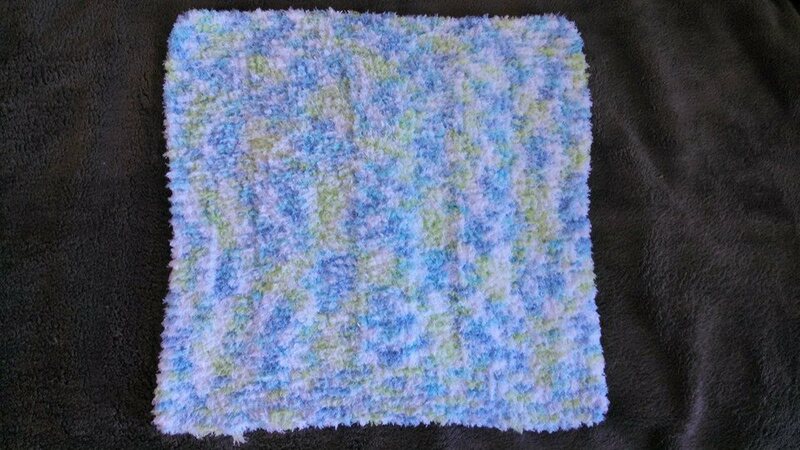 He also wants a scarf, so I will work with this yarn again to create some kind of scarf, which I will share as well! Anymore, it seems like I finish one project, and add 2 more. 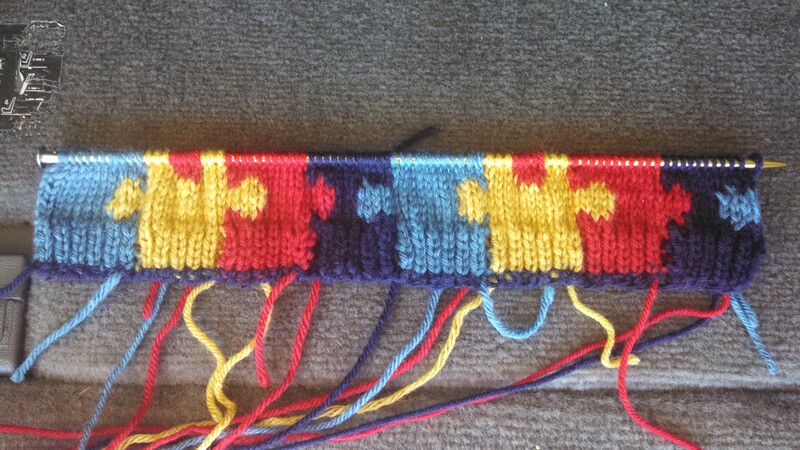 Knit across about 5 rows. Repeat until blanket is almost a square. 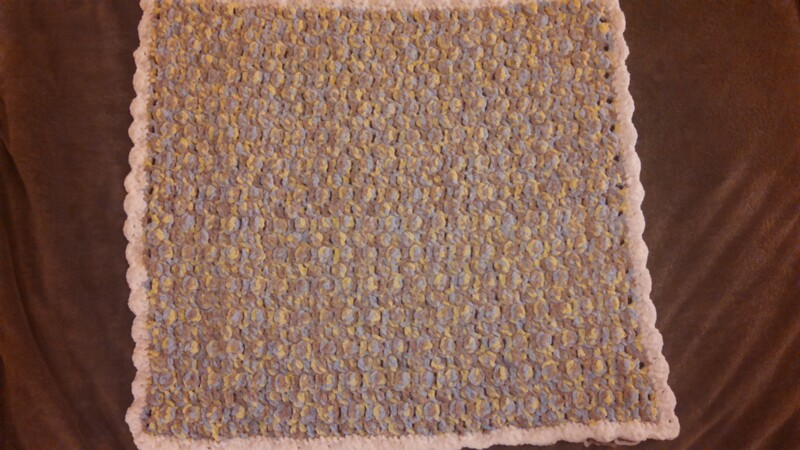 Knit across about 5 rows to finish. 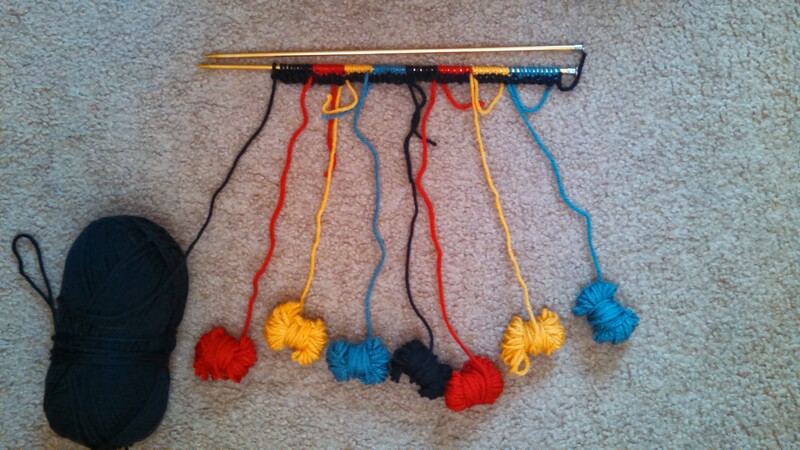 I used 14″, Size 10 1/2, knitting needles. One ball of this yarn, which is 100g, 109 meters / 120 yards, makes 1 blanket approximately 13″ x 13″. 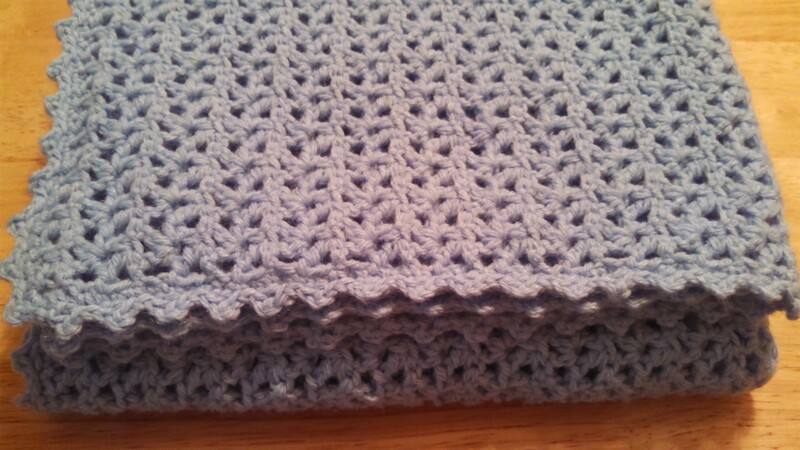 It’s not a huge blanket, but I was going more to cuddle and take with, so it’s not as bulky to carry around. Here are the 2 that I have finished. The green and purple one got pulled at little tight as I was finishing it up, which is killing my perfectionist mind, but it’s still really cute. 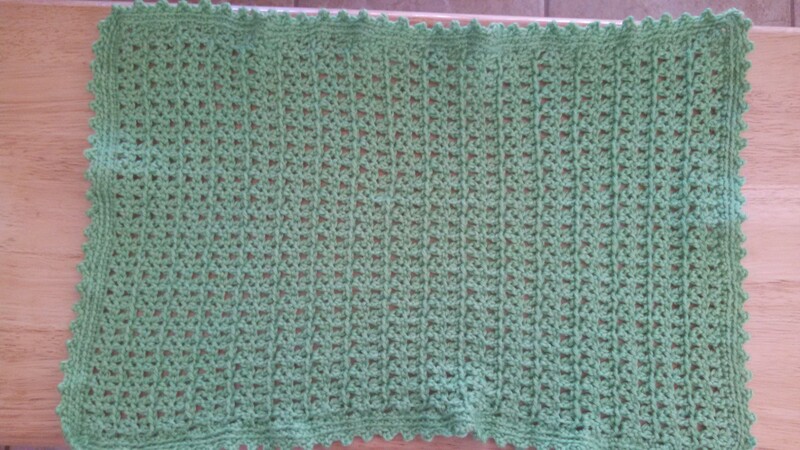 I am working on 2 more in solid colors, 1 in Chocolate and 1 in Lime. I let both of my girls pick out yarn to make a scarf. 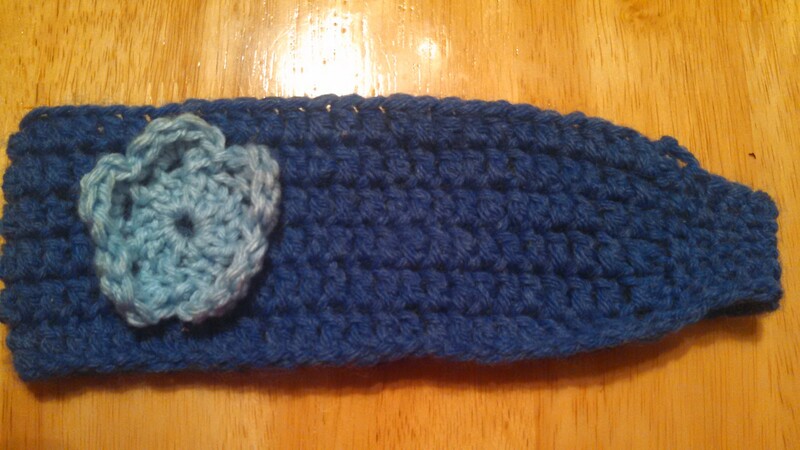 When I finished the first one, I had not enough yarn for a hat, but enough to make a headband. 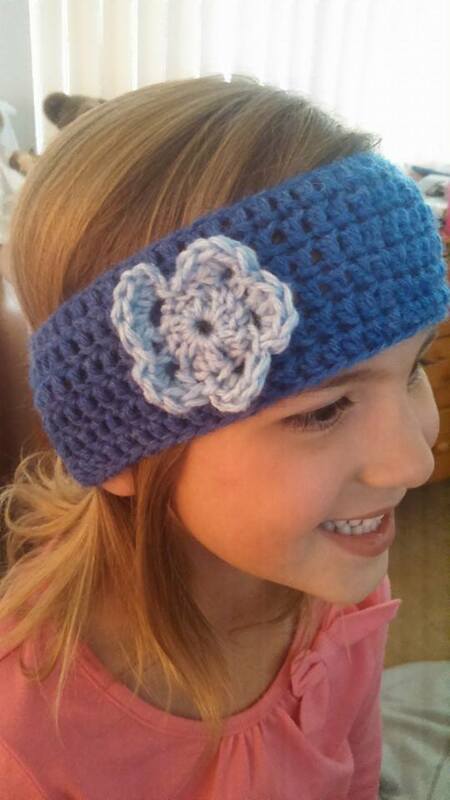 So, I luckily found this quick and easy pattern for a headband, and made a few more Flower Appliques for the accents. 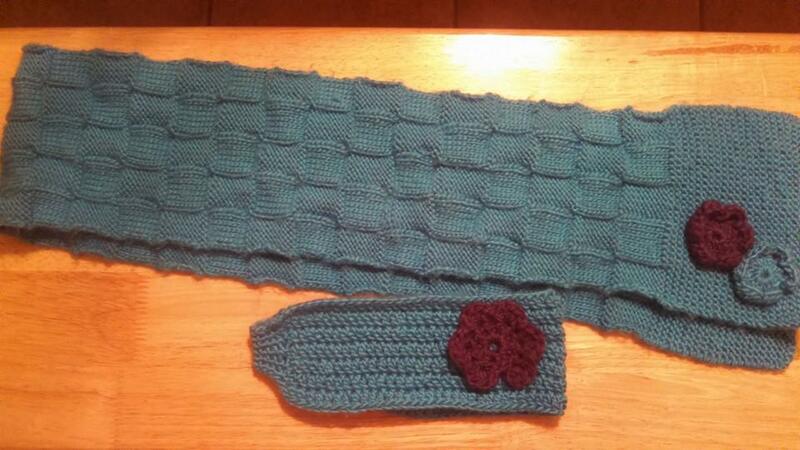 (Don’t worry, I’ll post more on the knitted scarves later after I FINALLY finish the second one!) I finished each of these in a few hours each. My girls love them! 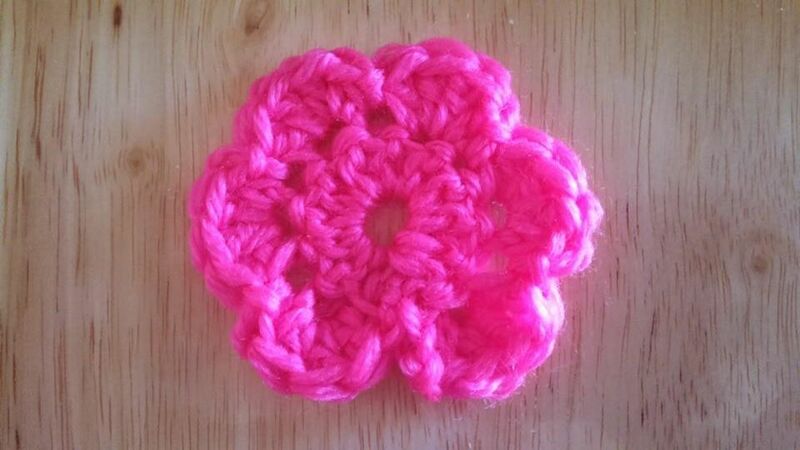 I have had a small Learn to Crochet kit sitting in a closet for a while that had patterns for a peace sign, a flower, and a heart. I decided to start with the flower. 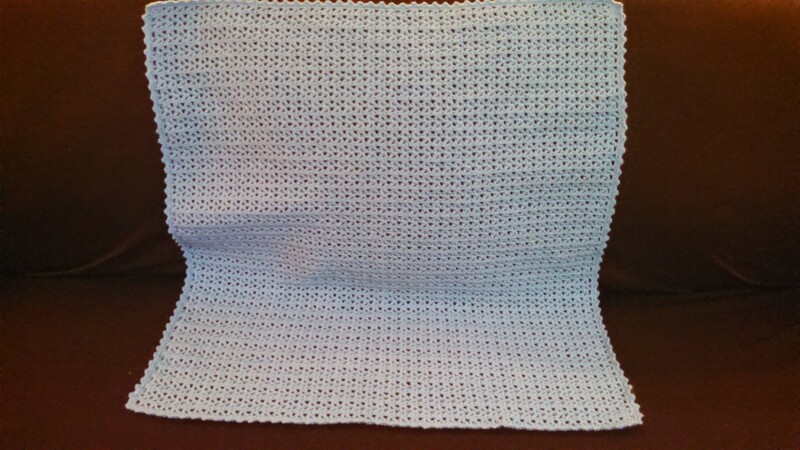 The directions were a little confusing and not working out for me (I think I started and pulled the stitches about 10 times! ), so I headed online. I found this pattern, Flower & Leaf Appliques, and after a lot more attempts, finally got a flower! Once I was able to create this, it gave me confidence to try more. I now have also made a few flowers to use as accents to some other pieces. 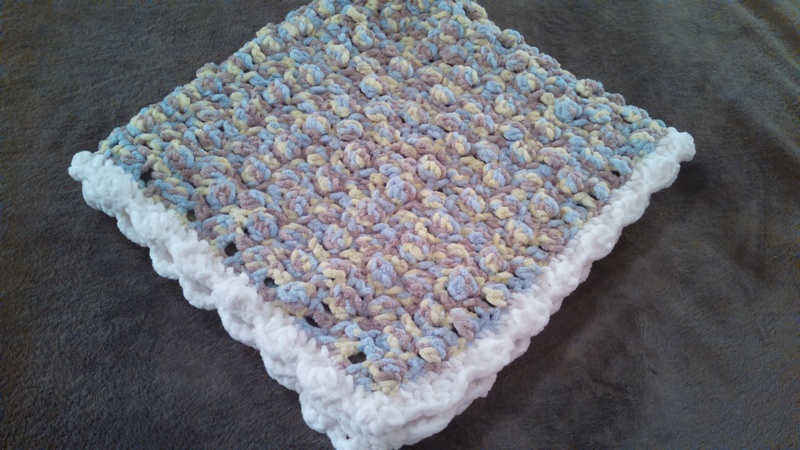 It’s now a quick, easy project since I know more of what I am doing!